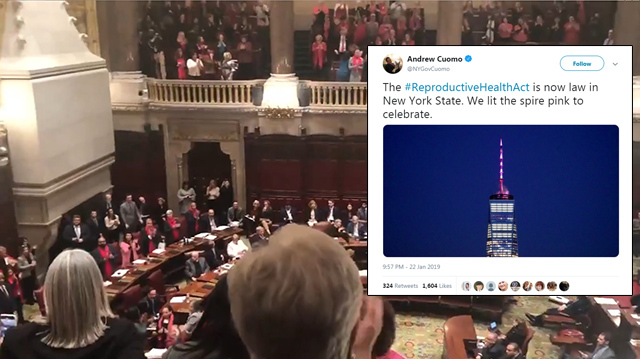 The State of New York has effectively legalized abortions up to birth and leftists and Governor Andrew Cuomo are absolutely giddy. A New York Public Radio reporter said she heard a voice shout, "May almighty God have mercy on this state!" in the Senate soon after the vote. The bill appears to restrict late-term abortions, but it adds a broad "health" exception for abortions after 24 weeks. The exception would allow women to abort unborn babies up to nine months of pregnancy for "age, economic, social and emotional factors, rather than the biological definition of 'health' that normally comes to mind," according to New York Right to Life. Governor Cuomo signed the bill into law just hours later and lit the spire on the Freedom Tower pink to "celebrate." I may be old fashioned, but there's something about celebrating the legalization of baby murder which rubs me the wrong way.